We’d love your help. 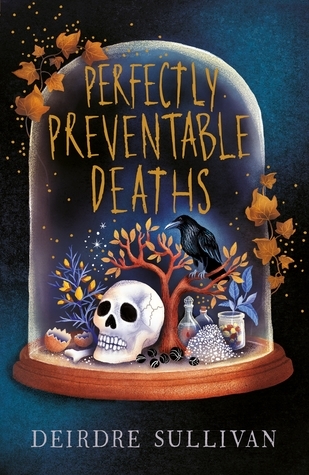 Let us know what’s wrong with this preview of Perfectly Preventable Deaths by Deirdre Sullivan. Fifteen-year-old twins Madeline and Catlin move to a new life in Ballyfran, a strange isolated town, a place where, for the last sixty years, teenage girls have gone missing in the surrounding mountains. As distance grows between the twins - as Catlin falls in love, and Madeline begins to understand her own nascent witchcraft - Madeline discovers that Ballyfrann is a place full of predators. Not only foxes, owls and crows, but also supernatural beings who for many generations have congregated here to escape persecution. When Catlin falls into the gravest danger of all, Madeline must ask herself who she really is, and who she wants to be - or rather, who she might have to become to save her sister. To ask other readers questions about Perfectly Preventable Deaths, please sign up. It sounded interesting and could be that. But. First it seemed just boring but then most of characters started to irritate (and I am not speaking of the main criminal here). Some dialogues and actions of characters (especially in the end)just shocked or caused laughter. Really, you'd thus react to such things happening? The ending seemed totally childish. Maybe somebody would like it but I expected much more.